Macroscopically, this type, which occurs only at En Lachat, differs from CE1a mainly in terms of colour: it is a darker grey N4 to N5, a feature resulting from impregnation by organic matter. Matrix: Depending on area, either colourless and subtranslucent, or dark grey. 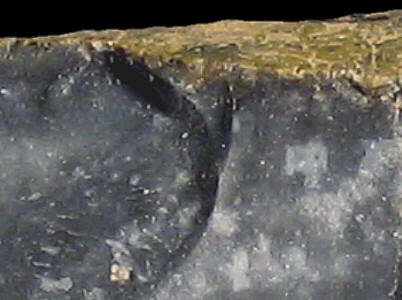 Grains: 10 to 12.5 %, whitish skeletal grains, subangular with high sphericity (200 to 300 µ), rare clasts (500 to 1000 µ). Grain composition: Numerous planktonic foraminifera (biserial Heterohelicidae and small globose forms), several discrete punctated spheres of 250 µ, numerous monaxon and triaxon sponge spicules, occasionally thick-walled, sea urchin radioles, echinoderm fragments. 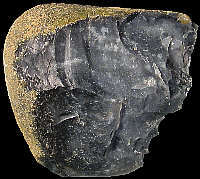 Other types of flint: The flint here constitutes quite a mixed lot, with predominantly Late Cretaceous material like CE1a, CE1c, CE2, CE3, CE4a, CE4b, and CE5, but also Hauterivian (Early Cretaceous) material of the Ht3-type.